Cleaning and laundry have quickly become the bane of my existence. Okay, so that may be a bit dramatic − nevertheless, it never stops, and I feel like I can never keep up with it. Currently, our household is made up of three inhabitants: my husband, Bernard, our 18-month-old Bull Terrier Alvin, and myself. 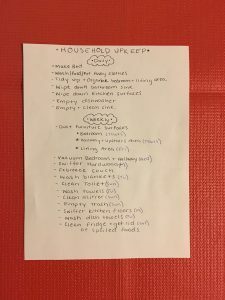 I struggle with home upkeep now, and I am concerned that if I don’t get a handle on it that it will become harder to establish good cleaning habits when we start expanding our family. I am aware that this is the 21st century and a modern day woman might argue that the responsibilities of cleaning and laundry should not fall solely upon me. Yes, my husband could share or even do all of it himself. But, we are a team, and each of us has our roles in the household, which we established before getting married. I neither like nor want the task of dealing with the trash and recycling. I am not mechanical, so I do not handle the maintenance issues that arise. Those jobs, just to name a few, fall under Bernard’s role. I enjoy cleaning and feel satisfied when I finish, and Bernard isn’t the best at folding, so we chose to divide the household chores accordingly. Nowadays, I have been struggling to fulfill my part, and it is stressing me out. I feel I am failing in my responsibilities as a wife, and I am sure I am not the only wife that has felt this way. Still, I recognize that I need to make a change in my habits for the future and also for my present mental well-being. Why are household upkeep practices important? There are many reasons why it is important to have good house upkeep practices. High traffic areas such as the kitchen and bathroom are crawling with germs, and cleaning those areas on a regular basis could prevent illness. An organized house can lower your stress levels and reduce distractions. I often find that if I am surrounded by clutter when I try to sit down to write a blog post, I can’t focus until I clean it up. Which leads me to my next point: a disorganized or sloppy house can be time-consuming. If you are like me and tend to put off laundry or cleaning, then you to have noticed that things tend to pile up. Eventually, you reach a point when you can’t put it off anymore, and then you end up needing an entire day to get yourself caught up. Also, when a house is disorganized, locating specific things becomes significantly more challenging. I began researching how to best keep up with the upkeep of a household. Creating (and sticking to) a cleaning schedule appeared to be the best option to establish a good habit of getting things completed. An article by Chrissy Halton from the website, “Organise My House” explains that “Before you can write a realistic cleaning schedule for your home, you need to know what you have to do to clean it in the first place.” Halton suggests going room-to-room and writing a list of everything you want/need to clean and also write how often you want it done. I did as Halton suggested, and, by the end, I had a solid list of tasks with which to start. I then marked each item as either daily, weekly, monthly, or seasonal. After that, I combined all of the items on the list with the same frequency. The article then goes on to state that each task on the schedule should be assigned to a particular day (i.e. wipe down the bathroom counters on Thursdays). However, I skipped this step because my schedule changes from week to week. Instead, I split each weekly task by day of the week, each monthly and seasonal item by the weekend in the month. Daily items will be completed right when I get home from work and at night after dinner. Now that I have a manageable household upkeep schedule, I need to put it into action – starting today. I will report on my progress, setbacks, and how my stress levels are faring. 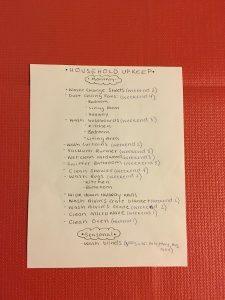 This entry was posted in Wives and tagged cleaning, household, housework, laundry, organization, schedules, wives. ← Can We Please Move The Box?